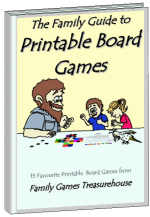 Pinata (or piñata as it is more correctly written) is a fun and easy game for everyone to get involved in. See who can break open the piñata first and claim the candy! Aim: To be the first to break open the pinata. 1. Before you begin to play, you must buy or make a piñata. A piñata (pronounced pin-YAR-ta) can be easily made from cardboard or paper maché and then decorated with bright colours, or you can buy a piñata (through Amazon for example). It could be painted or covered with crepe paper. Fill the piñata with lollies or other treats and hang it on a tree branch or something similar so that it hangs at about head height for the children. 2. 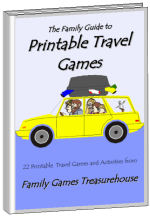 Starting with the youngest child, the children take turns to be blindfolded and spun around. They then attempt to hit the piñata and break it open. Children have one turn each. It will take several attempts before it is broken. 3. The winner is the child who breaks the piñata, but allow everyone to share the lollies. Easter Piñata: Make or buy an Easter piñata. Fill the piñata with lots of mini Easter eggs. Christmas Variation: Make or buy a Santa piñata. Fill the piñata with lots of candy canes and other Christmas goodies. Thanksgiving Variation: Make or buy a turkey piñata. Fill the piñata with lots of Thanksgiving-related treats. 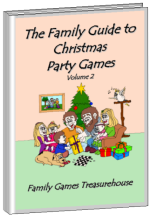 Do you have a favourite Party game that you want to share with all our readers? 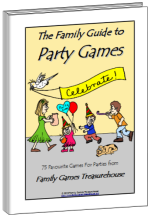 You can share YOUR Party game and/or check out other readers' favourite Party games. It's easy! 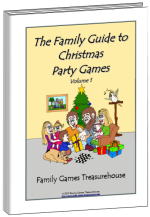 Just click on this share YOUR Party game link and follow the instructions.